The Arts and Industries Building occupies a prominent site on the National Mall and is one of Washington DC’s most underutilized historic landmarks. 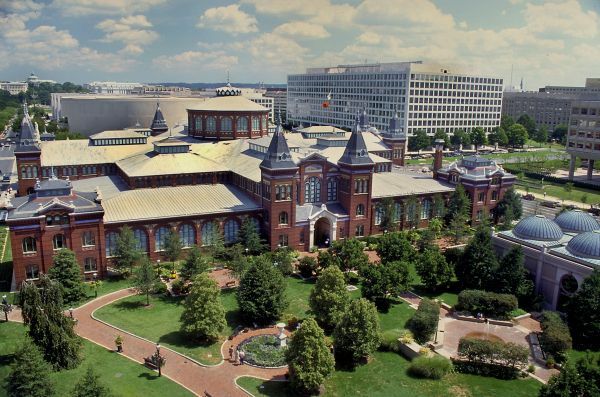 It is the second oldest building of the Smithsonian Institution, built in 1881 to house collections when the Castle (the Smithsonian's original building) had outgrown its space. In 2006, the Arts and Industries Building was named as one of America's Most Endangered Places by the National Trust for Historic Preservation. It is currently closed for renovations. The building design is symmetrical, composed of a Greek cross with a central rotunda and an iron truss roof. Above the north entrance is a sculpture entitled Columbia Protecting Science and Industry by sculptor Caspar Buberl. 900 Jefferson Drive SW, Washington, DC. The building is located on the National Mall, between the Smithsonian Castle and the Hirshhorn Museum. After undergoing a ten-year, $55 million renovations, the Smithsonian’s Arts and Industries Building will remain closed. Over the past decade, the building has received a new roof, new windows and a modern security system, all paid for with federal funds. After a financial study, the Smithsonian has concluded that there is enough money to reopen the building. The legislation is pending to convert the space to the proposed National Museum of the American Latino. On March 4, 1881, seven months before the building opened to the public, the Arts and Industries Building was used for the inaugural ball of President James Abram Garfield and Vice President Chester A. Arthur. The ground floor was initially dedicated to a wide range of exhibits including geology, taxidermy and animal exhibits, ethnology, comparative technology, navigation, architecture, musical instruments and historic artifacts. In 1910, many of the collections were moved to the new US National Museum, now known as the National Museum of Natural History. For the next 50 years, the Arts and Industries Building showcased American history and history of science and technology collections. Notable artifacts were the Star Spangled Banner, the Spirit of St. Louis, and the first display of the First Ladies Dresses. In 1964, the remaining historical collections were moved to the new Museum of History and Technology, now the National Museum of American History and the National Air Museum took over the rest of the building. The Air Museum remained in the building until its own building opened in 1976. The Arts and Industries Building was closed from 1974 to 1976 for renovation and reopened with 1876: A Centennial Exhibition, which displayed many of the original objects from the Philadelphia Centennial. In 1979, the Discovery Theater began producing programming for a young audience in the building. In 1981, an experimental sensory garden for handicapped visitors was developed on the east side of the building, and in 1988 it was renovated and named the Mary Livingston Ripley Garden. In 2006, the building was closed due to its deteriorating condition. In 2009, it received funding through the American Recovery and Reinvestment Act of 2009 and is currently undergoing renovation.